Use the congressional map for a listing of members of the US Congress by state and district and for information on candidates and races. Find your senator or representative by address or zip code. Click on a state on the map to view senators and representatives plus links to profiled JACPAC candidates. Find more on your representative and senators. Although each election contest is judged on its particular merits, JACPAC sticks with incumbent friends over challengers; stays out of primaries (unless the primary IS the race); stays out of races in which candidates on both sides equally meet JACPAC's criteria. 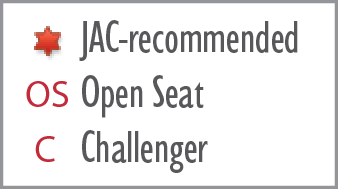 A JACPAC recommendation means a candidate meets JACPAC’s criteria and is generally aligned with our values. It does not always guarantee a perfect record on every vote or issue. Congressional elections are held every two years for all seats in the House of Representatives and one third of the Senate. Senate terms are six years, and House terms are two years.